There are few summer activities that are better for an adventurous group of friends than camping. You get to fish on a secluded lake, or play volleyball in the shade of evergreen trees. You can stay up late and eat and drink around the dying embers of your campfire. Best of all, you get to avoid the hustle and bustle of city living for a few days. Just don't forget to bring everything you need when you go! There are a lot of different items you'll need or want if you plan to go camping. Certainly, a tent is one of your top investments, but so are sleeping bags, hiking packs, tools and even dependable boots. In addition, you're going to need gear for cooking, and a cooler to store your perishables. Finding the perfect equipment for your camping trip can seem complicated, simply because there are so many choices. What size tent do you need for you and your family or friends to sleep comfortably? How much weight does your hiking pack carry without becoming overburdened? 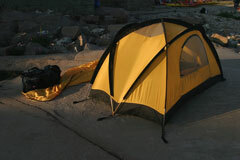 Sports-Equipment.us can help you find online and local sporting goods retailers that have the camping gear you need. You'll also have access to information about popular campgrounds and parks throughout the country. Supplier of specialty outdoor gear and clothing. Founded in 1938, Recreational Equipment Inc. has grown to offer an extensive selection of outdoor equipment and apparel via the Internet and through its chain of retail stores. This New Jersey-based retailer offers a wide selection of outdoor gear and apparel. Their retail store has a well stocked camping department. Montana-based source of outdoor equipment and sporting goods. Bob Wards was founded in 1917 and features this online camping gear store.